The 2016 excavations at Chlorakas-Palloures. 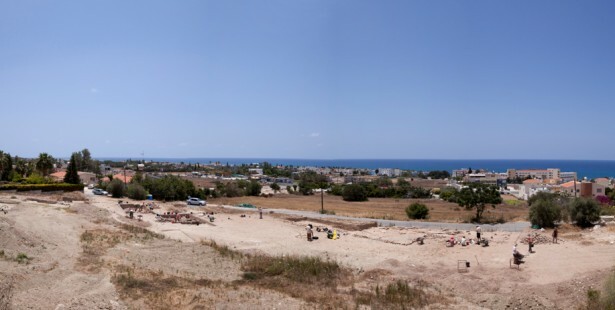 Two small neighbourhoods of the 5,000 year-old site of Chlorakas-Palloures were investigated during the second season of excavations at the site. In the north section of the area a large and monumental, well-built, domestic building was unearthed, with plastered interior and exterior surfaces. In the centre of the building a large mortar installation was found as well as a hearth measuring 2.5 meters across. Next to the building, other similar ones were identified. In the south section of the area, a series of smaller round houses were excavated, measuring around 6-8 meters in diameter. This, however, was by no means the poorer quarter of the site. In this part of the settlement a number of copper artefacts were found – which are among a few known so far for the Chalcolithic period, as well as beautiful figurines. It is becoming increasingly clear that the settlement at Chlorakas-Palloures was an important settlement in the Chalcolithic period, with access to high quality flint and picrolite (used for figurines), metal artefacts, and large well-built houses. The excavations, directed by Dr. Bleda Düring of Leiden University, are conducted in collaboration with the Department of Antiquities of Cyprus.